Belt Sanding. (c) 2009 Chris Baylor licensed to About.com, Inc.
On a recent visit to Ali Industries, manufacturers of the Gator Finishing sanding system, we were able to learn the steps used to make sanding belts. It's a rather interesting story, as there are some steps incorporated to make the belts durable that are somewhat surprising. 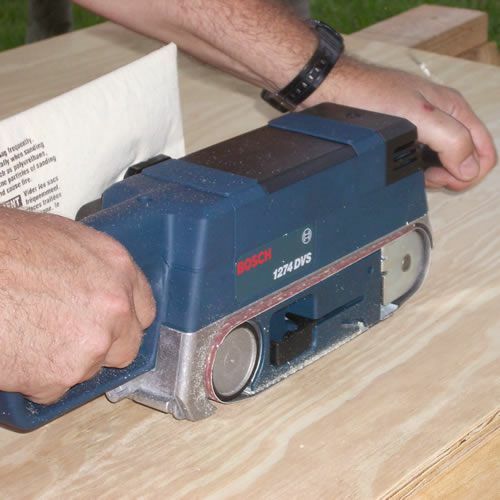 Sanding belts are nothing more than specially constructed sandpaper with the ends connected to form a loop. Because belt sanders tend to be workhorses that generate a lot of heat, one might expect that the joint holding the two ends would be the weakest point, but as you'll see in one of the upcoming steps, tensile strength testing actually shows that the steps taken to create the joint make it stronger than the paper it connects! Making Sandpaper. (c) 2009 Chris Baylor licensed to About.com, Inc. 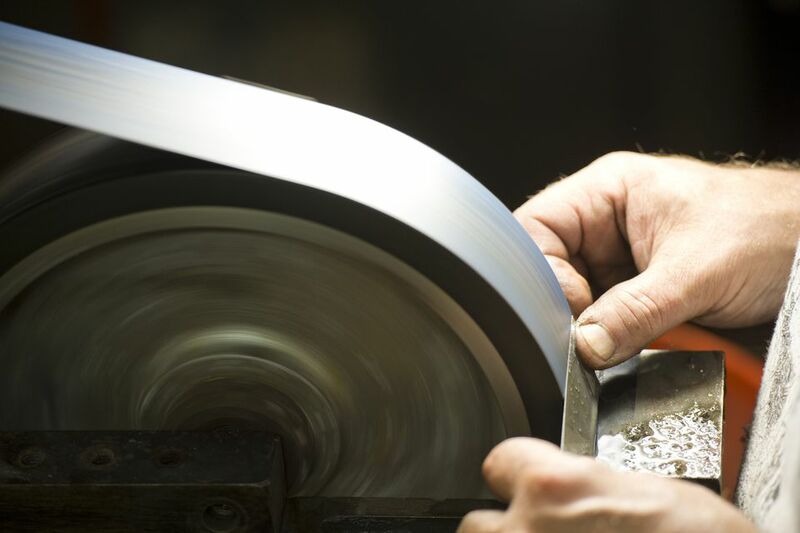 The first step to making sanding belts is to create an exceptionally strong type of sandpaper, with a special cloth-type backing. Because belt sanders are especially hard-working, the sanding belts must be especially strong. The steps to making the sandpaper for sanding belts is essentially the same process as is used in making sandpaper. However, a special cloth is applied to the back that gives the paper additional strength. Cutting the Sandpaper. (c) 2009 Chris Baylor licensed to About.com, Inc.
Once the specially made sandpaper is manufactured into large rolls, these rolls are placed onto a cutter that cuts the paper into 12-inch wide strips at the desired length. The two ends are cut at an angle, which is vital to the strength of the joint in an upcoming step. After these strips are cut, they're stacked and properly oriented by hand by an attendant at the end of the cutting machine. Applying Glue to the Sanding Belts. (c) 2009 Chris Baylor licensed to About.com, Inc.
With the sandpaper cut into the strips for the sanding belts, these strips are placed into a long machine that applies glue to the angled edge of the paper. The glue is dried slightly and then stacked in a staggered position at the end of the machine. Applying Kevlar Tape. (c) 2009 Chris Baylor licensed to About.com, Inc.
After the glue is applied to the edge of the sanding belt strips, an assembly worker applies a strip of blue, bias kevlar tape to the glued edge of the sandpaper strip. The tape is pulled from a roll and applied with a half-overlap, and then is cut with a razor blade knife, before moving on to the next piece of sandpaper. Connecting the Ends of the Sanding Belt. (c) 2009 Chris Baylor licensed to About.com, Inc.
After the kevlar tape is applied, the sandpaper strips are moved to a machine where a worker connects the two ends. This machine presses the two ends together into a very strong joint using a process called vulcanization. The machine holds the joint in place for about 30-seconds as the joint cures. Once the joint is completed, a 12-inch wide belt of the required length is created. This belt is placed onto a conveyor and carried to the next station. Cutting Sanding Belts to Width. (c) 2009 Chris Baylor licensed to About.com, Inc.
After the joints are cured, the sanding belts are cut into the appropriate widths on a spindle cutter. This machine can be adjusted to cut blanks to whatever widths are required (typically either three or four-inch widths). The belts are then stacked one inside another in the appropriate quantities by an attendant and prepared for packaging. Preparing Packaging. (c) 2009 Chris Baylor licensed to About.com, Inc.
After the sanding belts are cut to the appropriate widths and are stacked (inside one another) in the proper quantities, they are inserted into the appropriate packaging for hanging on store peg hooks and are boxed and prepared for shipment.